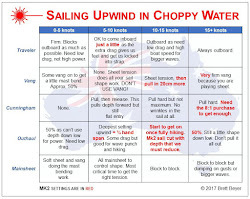 Improper Course: Full rig or radial? When I first met Doug he weighed about 192 lbs. When we started eating together, I soon realized that I was going to end up gaining weight and that just wouldn’t do. I introduced him to something called food combining and convinced him of its health benefits. Unbeknownst to me Doug doesn’t do anything half way. He jumped into food combining with both feet and in a matter of about a month he’d dropped 30 lbs. He stabilized at about 162 and said he’d never felt better. At that point he didn’t look like his skin fit anymore and people were beginning to politely inquire about his health. Oops! He competed in the Master Worlds in Halifax and sailed a full rig and came in 6th in the Grand Master full rig division. It was a windy series and he swore he couldn’t hang with the guys in front. He could hold his own downwind but they’d gain about 10 seconds every upwind leg. He made a couple of stupid mistakes that probably cost him a place or two and it was before his multiple eye surgeries so he was pretty much legally blind (kind of like now). Nevertheless, he was certain that even if he’d sailed a perfect regatta, he couldn’t win at that weight, in that fleet, in the full rig. Doug tried to put on weight before competing again but it just wasn’t happening. He decided to switch to the radial rig for World competitions and stay at what he thought was a healthier weight. He came in 4th after a three way tie in Brisbane in the Grand Master radial division. He didn’t blame losing on his weight but on his technique in open water. He had one race where everything clicked and felt right and he was launched and won by a good distance. But that only happened for one race. Robert Scheidt, a 40 year old master, competing in a full rig in the open fleet in Oman last week was sailing against the fittest and best Laser sailors in the world. He weighs about 2 pounds less than Doug does right now. Hmmm. As a female learning how to play golf a few years ago, I soon learned the difference in muscle power and technique. My male golf partner could out hit me from day one and I couldn’t match him no matter how hard I tried. Then I took some lessons and learned the secret power behind proper technique. A swing with proper form produced a beautifully light sounding ‘tink’ and seemingly, without effort, the ball was flying through the air with the greatest of ease. My partner had muscle and I had technique and I was winning. I can’t help but wonder if Doug is doing himself a disservice by not embracing the opportunity to fine tune his technique instead of focusing on tonnage. 162 lbs is perfect for the Radial on open water, and in any case, height is everything. How tall is Doug alongside Robert Scheidt, for example? Yikes - I'm 170 today and am losing about 1 pound/day... hard to do with the all the good food (and Thanksgiving turkey tomorrow). Don't know for sure about Robert but I'm 6' 0" and he's probably 2-3" taller than me. But on the water, he looks much taller. Robert Scheidt is one of the fittest sailors in the world and always been. No doubt but surely a 40 something's edge against 100+ 20 somethings was his technique and not his fitness. I think body weight is a bigger factor in Laser sailing than it is in golf. The physics of the two sports dictates that. Having said that, I think a lot of us Laser sailors do obsess too much about the importance of weight; I'm sure fitness and technique are much more significant. I just looked back at my own records and discovered that my own best Masters Worlds result was achieved when I was 10-15 lbs heavier than what is normally considered an ideal weight to sail a full rig, and it wasn't a particularly windy regatta. I suspect I did well (by own standards) because I had done more competitive regattas than I usually did in the months leading up to the Worlds. But I can't resist asking... how much does Robert Scheidt weigh these days? About 77 kg (169.7 lbs). I love this sport because you can ask a girl her age and weight and not be considered rude. Interesting comment. When we looked at Doug's preparation for the various Worlds we couldn't find anything that would be a predictor of success. Doug what was your weight at the different Worlds? We didn't even look at that. Also, most people are wearing hiking pants and boots, and they weigh 7 lbs. If I get to my target of 168, then it will be equivalent to weighing 161. That's more like it! 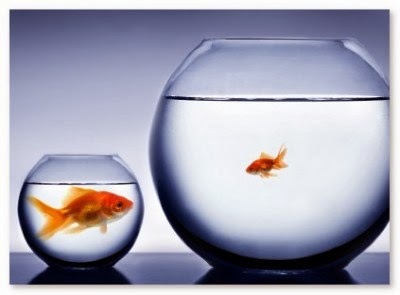 One thing I do see - your worst result came with your heaviest weight..! With your 6' of leverage and target weight of 168 you have the luxury of being able to choose your rig depending on the conditions. 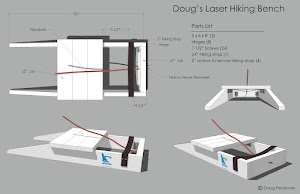 At 5'8" I was told a few years ago by a well respected Laser coach that I'd need to weigh almost 200lbs to have the required righting moment for the Standard rig Laser. 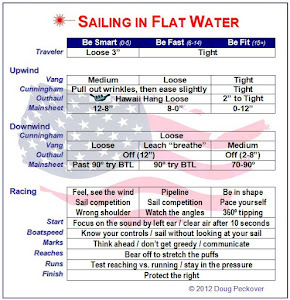 My wife didn't really fancy the thought of me being that fat, and I now generally sail Radial on open water, unless the wind is forecast to be light. For Oman, at my current weight of 163 I'd be seriously considering the Standard rig. Oh, and your 2nd worst result came with your 2nd heaviest weight. Back to the Thanksgiving turkey it is then! I think I'm about the same height as Robert (6' 2") and I was around 168-70 lbs when I was 21, but it's a long time since I've been close to that weight. When you google him most sites have him as 183 lbs. I wonder if he deliberately lost a few pounds in preparation for Oman? We assume yes. A lot of people did this for the Beijing Olympics that also expected light conditions. The top Laser sailors are really dedicated! I see several pattens in Doug's results. 1. He wins the Masters Worlds every time he sails it when it's not in Europe, North America or Australia. 2. And he always wins it when the winds are "mixed." 3. Also he never wins it when I am there. On that basis, he should have an excellent chance in Oman.